What makes a picture book special? Questions like that have engaged me as a reader/reviewer for several years now! I always know when I’ve found one, but defining exactly what makes it that way is tricky. If you want to start buying picture books to put away for Christmas, here are some extra special suggestions. This children’s picture book is special because both story and illustrations are poignant and unusual. The Farmer and the Clown is a wordless picture book, inviting children to tell their own stories about the illustrations. I love that wordless picture books offer adults an opportunity to nudge children toward making inferences about a visual narrative. What might that be falling off the train? How do you think the little clown feels? I wonder why the farmer did that? Children of different ages will respond to the story at their own level. I have previously reviewed Frazee’s The Boss Baby. In The Farmer and the Clown, her illustrations are spare, and mostly with a limited palette. They put the focus squarely on the characters, whom we sometimes see in cameo. The return of the circus train is a celebration in colour, and the final page is an absolute delight. Adelaide’s Secret World by Elise Hurst, published by Allen and Unwin (2015). RRP: $Au24.99. This is another picture book which is unusual. I have previously reviewed Elise Hurst’s Imagine a City, which I loved. Adelaide’s Secret World is quite different, and yet displays that same quality of encouraging dreams and imagination. Set in a mysterious city inhabited by a rich cast of characters, this enchanting and superbly illustrated story celebrates creativity and friendship. Adelaide leads a quiet life in the midst of the city. At night she listens to the song of the stars, but during the day she watches over the others like her: the still ones, the quiet ones, those who dance and dream alone. Little does Adelaide know that her secret world will soon be transformed into something unexpected and full of joy. There’s a lovely richness, sumptuousness even, to the illustrations. Although the theme isn’t about Christmas, it reminds me of those wonderful fairy tales I read around Christmas time, those that made me give wide gap-toothed smiles and hug myself with delight. Although we start with Adelaide “…all alone, and the quiet stillness crept into her heart and stayed.” children will know in their own hearts that things will improve. And so they do. A beautiful book with an uplifting ending. Abigail by Catherine Rayner, is a Little Tiger Book, published in Australia by Hardie Grant Egmont (2015). Abigail loves to count. It is her very favourite thing. But when she tries counting Zebra's stripes and Cheetah's spots, they just won't sit still. It's hopeless! What will Abigail do? A beautiful book by award-winning author-illustrator Catherine Rayner, full of gorgeous illustrations of Abigail the giraffe and her friends Cheetah and Zebra. Abigail is a perfect bedtime read with a stunning fold-out night sky ending. Shortlisted for the 2014 Kate Greenaway Medal! The pre-schoolers I read to during Storytime at the Library truly love to count too. They will understand both Abigail’s interest in counting, and her frustration when her animal friends make counting very difficult indeed. Rayner’s illustrations in beautiful watercolour are a very special joy. Mr Huff by Anna Walker was published by Penguin (2015). I have previously reviewed Alfie’s Lost Sharkie, and Hurry Up Alfie. Bill is having a bad day. Mr Huff is following him around and making everything seem difficult. Bill tries to get rid of him, but Mr Huff just gets bigger and bigger! Then they both stop, and a surprising thing happens . . . I would go so far as to make the sweeping generalisation that any picture book by Anna Walker I have seen is special. Her illustration style is perfectly suited to the gentleness of her stories, and the fact that while they may have hilarious humour, they still have an innate sweetness to them. To me, that makes her picture books perfect for young kids. Get more of an idea of Mr Huff, by checking out its trailer, embedded below. Pig the Fibber by Aaron Blabey, published by Scholastic Press (2015). RRP: $Au 16.99. Following on from the success of Pig the Pug, we now have Pig the Fibber, the same dog, who learns what happens to pugs who tell big fibs. He's back! But this time Pig, the world's greediest Pug, is telling great big lies. Won't he ever learn? Another laugh-out-loud book from the best-selling creator of Pig the Pug. I love how Pug is scribbled out in the book’s title and replaced with red crayon “FIBBER”! Pig is seen below, looking guilty, with a red crayon in his mouth. Next is an end paper containing a bookplate declaring this book to be Trevor’s, again covered by red crayon caps: NO. IT’S PIG’S. This silliness sets the tone for another of Blabey’s special romps, romps that will have kids in fits of giggles, and perhaps thinking about the probable results of dishonesty. My Dog Bigsy by Alison Lester, published by Viking, an imprint of Penguin (2015). Meet my dog Bigsy. He's only small, but everyone knows he's the boss. Each morning he visits the animals on the farm. Squawk, neigh, quack, moo, baa, oink, cluck, purr, ruff ruff ruff! What a lot of noise! And all because of Bigsy! From Australia's favourite picture-book creator, comes this energetic story about a little dog who causes a big commotion. Somehow Lester manages to capture the essence of those little yappy, self-important dogs that love to annoy other animals on a farm by barking at them. My Storytime children adored this book. It has lots of animal noises for them to join in with, as well as some sly humour for the listening mums and dads. I loved the double page map of the farm, showing Bigsy’s journey, and the double page spread of Bigsy, with all his interesting bits labelled. A special book for any special youngster, especially dog-lovers. This wordless picture book opens children’s minds to all sorts of possibilities and stories. In my observation, it can be difficult for illustrators to strike the right balance in such a picture book. What balance? There needs to be an identifiable narrative, as well as an opener to several interpretations within that narrative. Some books require intense scrutiny before the narrative can be identified at all - most readers won’t persevere for a long time. The Umbrella is special because it gets this balance exactly right. Delve into Process Drama, using The Umbrella. The Scarecrow’s Wedding by Julia Donaldson and Axel Scheffler, published by Scholastic UK, 2014. RRP: $Au 24.99. Why is this picture book special? Donaldson and Scheffler are both high profile and successful in the world of children’s literature. Donaldson was Children’s Laureate in the UK from 2011 to 2013, and is probably best known for her book, The Gruffalo. But to me, a book should stand on its own merits and this one does. It’s a lovely rhyming story, with the flavour of a fairy or traditional tale about it. Anyone old enough to remember Worzel Gummidge will meet another naughty scarecrow here: Reginald Rake. But first we meet two scarecrow lovers who want to marry: Betty O’Barley and Harry O’Hay. When Harry is off on a mission to find water for their wedding flowers, his place on the farm is taken by the aforesaid Reginald, a rakish chap who accidentally sets fire to Betty via the cigar he is smoking. Luckily Harry arrives just in the nick of time. They both live happily ever after, although presumably not Reginald, who disappears with a cough. As Big as You by Sara Acton, published by Scholastic Press (2015). RRP: $Au 24.99. This is the first picture book I know which opens top to bottom rather than left to right. That makes it a little trickier to read aloud to a group of children BUT it’s a perfect vehicle for comparing sizes, the core concept of the story. Claude is a large elephant. Finlay is a small one. Claude can trumpet so loudly the earth shakes! Finaly can only squeak and spurt tiny fountains with his trunk. Will he ever be as big as Claude? I love gentle picture books. Acton’s soft watercolours and sweet story complement each other beautifully. But please don’t let me give you the idea the story lacks drama. As Big as You offers many great opportunities for children to join in: echoing Claude’s loud trumpet and Finlay’s contrasting squeak, mimicking the elephants’ water spurts, ear wiggles and feet stomps. There’s tension when Finlay finds himself all alone, fear and excitement when Finlay falls and floats, and a lovely theme of each one of us being the perfect size for who we are right now. 9+1 Perfect written by Danny Parker, illustrated by Freya Blackwood and published by Little Hare, an imprint of Hardie Grant Egmont (2015). Have you been counting? Perfect actually makes number 10 on my list here. I had finished my post , added its title, and created the image for it, when I got a message from Dimity Powell, advising me to take a look at Perfect. It was in my enormous To-Be-Read pile but I took a quick look. And. Fell. In. Love. Perfect really is. It leaves you with a warm glow in your heart, and words and pictures dancing through your mind. The combination of Blackwood’s mellow, golden and light-filled illustrations and Parker’s lyrical but simple, rhyming and evocative text makes this one of those special picture books which will become a classic. The two creators help us all rejoice in long lazy summer days and evenings; days filled with kite-flying and sandcastle-building; night-times of cuddles and dreams. I loved it, and hope you’ll grab and share it with a young reader you love. SOON! And then - oh the fickle heart of a book reviewer! - a new picture book arrived chez Chook. 9+2 Please Open This Book was written by Adam Lehrhaupt, illustrated by Matthew Forsythe and published by Simon and Schuster (2015). You might also like to check out my reviews from last Wednesday, Picture Books about Family. 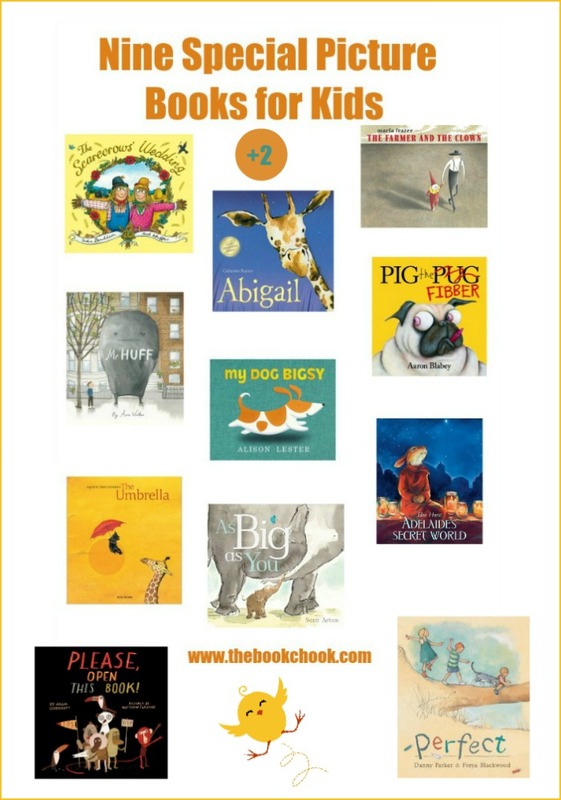 Find even more Children's Book Reviews on The Book Chook by clicking Reviews in the right sidebar.